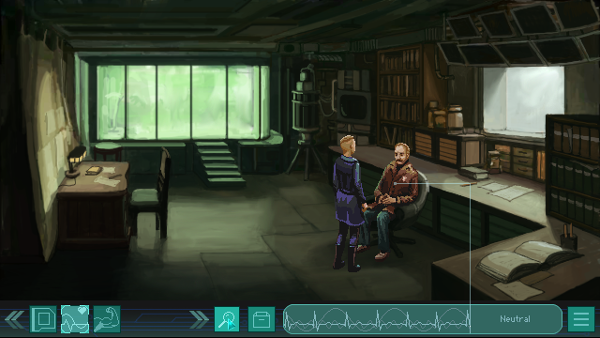 In Whispers of a Machine, a collaboration between Clifftop Games and Faravid Interactive, players take the role of Vera, a federal homicide detective sent to investigate a string of murders in a world that has, in years past, rejected aspects of technology which in turn caused a planet-wide collapse. I caught up with developers Joel Staaf Hästö and Petter Ljungqvist and discussed the finer points of their project, focusing on what sets the project’s universe and process apart. 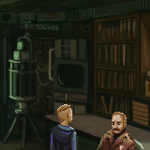 Erik Meyer: Whispers of a Machine looks amazing, but it certainly isn’t your first foray into adventure games; how have your projects like Kathy Rain and The Samaritan Paradox informed your current work? Joel and Petter: We both played fairly big parts in the other’s previous project (KR and TSP respectively) so not only did they teach us a lot about the craft itself, but also how to work together. 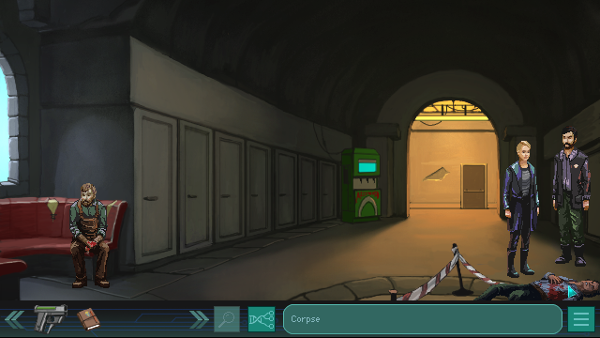 We obviously try to bring the best parts of our previous games into this project, while eliminating all the bad parts. EM: The game art uses a very specific drawn style, so how did you arrive at this exact look? As you’ve represented technology, sweeping shots of locations, and the characters themselves, what guides you? 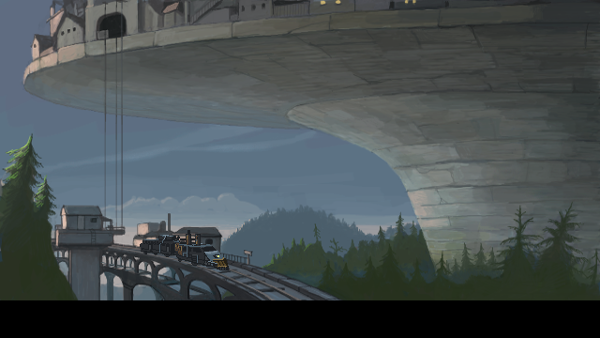 J and P: All the art is hand painted, and characters are even pixel painted, to give them a distinctly retro feeling. Since there are no prerendered textures, photo parts or 3D models, we hope to achieve a more traditional, drawn look. The visual style took some experimenting to arrive at; we didn’t want the clichéd post-apocalypse wasteland, especially since our setting isn’t really a dystopia – it’s just *another* kind of world. The future-noir look is appealing, but it’s also done to death, with its constant darkness and raining. EM: The universe you’re creating includes a unique view of religion and technology, so without getting too deeply into the plot, what do you see separating your world from the world we live in, and how does this fictional time and place draw the players in? J and P: The WOAM universe is an attempt to present a hypothetical model – what happens if we, very abruptly, put an end to all advanced technology? Much of our modern world, especially in the urban centers, is based on automation and digitization, and would collapse if we suddenly got rid of all of that. In our model, people have formed smaller, self-sustaining communities. So while we want the game world to be original and fascinating, we also aim to present a credible future scenario. EM: The game is being developed as a collaboration between Clifftop Games and Faravid Interactive, so in a practical sense, what does it mean that you’re working together? What aspects of the project fall in either court, and when larger decisions come to light, how do they get made? J and P: In simple terms, Clifftop Games equals Joel Staaf Hästö and Faravid Interactive equals Petter Ljungqvist, the duo creating WOAM. Generally speaking, Joel is responsible for code, project management, and the business side of things. Petter is responsible for art and animation. The two of us write and design the game together. Joel works full time on the game, Petter combines part time dev work on WOAM with a teaching job and taking care of two young boys. As for larger decisions, they tend to come as a result of long and detailed discussions amongst each other, typically ending in a compromise in one way or another. Every now and then we take in external input to try and resolve difficult problems. EM: From a writing standpoint, which came first, a fleshing out of the Nordsund location, the creation of Vera as a detective, or a need to investigate murders as a starting point? Similarly, as you’ve moved forward, how has the plot progressed? Did you begin with a fairly scripted set of events to flesh out, or have locations emerged organically? J and P: The setting came first of all, but it wasn’t Nordsund per se, but rather the broader premise of our world, how an AI disaster caused a worldwide technological collapse. We did have certain plot beats, puzzles and gameplay mechanics designed in advance, but overall things have evolved quite organically, both in terms of story and gameplay. EM: In WOAM, societal collapse came from a tight integration between AI and machines which had dire consequences when mankind shut things down. In modern-day America, a strong case can be made for an over-reliance on technology, so do you see this aspect of your project as a cautionary tale? J and P: We’d be reluctant to label the game as a cautionary tale since that creates quite specific expectations, but yeah, we do explore the role of technology in society, if the current path we are on is sustainable, and whether or not there is a healthy way to coexist and move forward. EM: A basic interactive menu occupies the bottom of the screen, so I’m curious about your views regarding additional information provided by HUDs, menus, and the like. What constitutes a solid, effective design, and what feels clunky? J and P: An effective UI is one you don’t have to think about, it’s just there and so integrated in the experience that you forget that it even exists. Generally, less is more, and if you can cut an UI element and still give feedback to the player in other ways, it’s usually the right call. How to achieve that, however, is a different story, and something most games struggle a lot with if they need to convey a lot of information. An additional hurdle for us is that we are building a common UI for PC and tablets, to save development time. This has forced us to build an UI for several platforms which may not be optimal on either of them, but quite time-saving for us in the long run. EM: The game has multiple endings and bills itself as story-driven, so as you push ahead, what takes up most of your time (debugging, social media, asset creation, etc)? When you reach the point of release, what criteria embody success? J and P: Due to the branching narrative of the game, most of our time has definitely been spent on discussing, writing and designing the story of the game, creating the different gameplay mechanics etc. These things have certainly been way more time consuming than more straight forward tasks such as coding and asset production. On release, I think we’ll both be happy if we have delivered on our promises to the players, released the game on time, reasonably bug free, and close enough to our original vision when we started the project. A good result in terms of sales and critical reception is certainly something we are striving for, since it would help us reach a larger audience and make more games in the future. But it’s not the primary concern, making the game we want to make, is.